This is my third ferment, so I still don't exactly know what I'm doing. Chose the lower salt-content due to blood pressure issues. This time I made sure to boil as much of the equipment as I could for >5 minutes (much of it >10 minutes), as well as washing it beforehand. 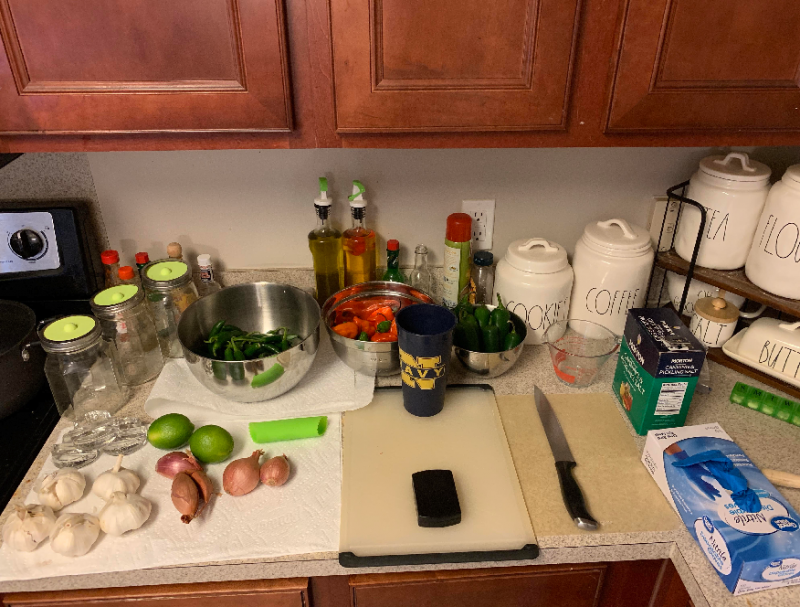 Featured in the background are the smoking chips I plan to age the ferment with in about a week (after cleansing them in Jack Daniels first). Hopefully that gives it a smokey, oakey flavor. I don't plan on making a sample bottle of sauce until 3 months in. Looks great Pharthan! I'd suggest an airlock for you - takes the hassle out of burping jars and helps keep outside air getting in. I ordered a pack of these about 4 months ago and like them more than the traditional airlocks I have used in the past. Looks good Pharthan. Boiling was a great idea. You may want to look into different oak chips. I have no experience other than forums, but it looks like what you have are for smoking meats and stuff. You'll probably want to get toasted wood chips from a homebrew store. These are intended to impart smokey, oaky flavors to beers (and hot sauce I suppose), whereas the ones you have are meant to be burned in a grill/smoker to infuse with meats. Additionally, if you do decide to look into toasted wood chips, you'll probably want to boil them to reduce the overall amount of tannin in the chips. This is common in homebrewing. I ordered a pack of these about 4 months ago and like them more than the traditional airlocks I have used in the past. Those look super convenient! Retains the reusability of a mason jar better than traditional airlocks. Pharthan if you decide to go traditional dual-s/three piece airlock, you can just drill a 1/2" hole in the mason lid and hot glue the airlock in place. If you decide to toss the jars later, you can easily pull the airlocks off to reuse later. I originally planned on toasted oak cubes, but I kind of thought to myself: What's the difference? It's still toasted oak, just previously used to hold whiskey. It's effectively what Tabasco uses. After a bit of soaking in Jack Daniels (and perhaps boiling, as you've suggested) I for the life of me can't find anything that would be different. I could totally be wrong, but... I dunno. I've just thought about it a fair bit. I'm new to the hotsauce game, so there is a definite possibility that whatever I could be overlooking could be more than just a minor thing, though. I looked in a few homebrewing forums, and they tend to get good reviews from all who have used them for homebrews. It seems that about 50% of people recommend sterilization. I'll probably start with Jack Daniels as a sterilizer, then a quick boiling water bath to try to get rid of some of the alcohol to prevent it from doing anything potentially bad to the sauce. Edited by Pharthan, 10 August 2018 - 07:23 PM. That mix looks spot on! If you want to sterilize and toast the wood , just put it in the oven at low heat. Ideally, it's already toasted. Some of the sides are already thoroughly blackened. I'm more worried about introducing contaminants, and don't want to give it a burnt flavor, just smokey. It's been four days thusfar. The mash smells fine - but there isn't any fermentation happening! Could this be because of too much moisture? There's no "pop" or pressure release when you open your jars? My first one didn't actively ferment for like a month. When it did, it wasn't a very vigorous fermentation either. I let the jars sit for six months. The end result was well received by several people. You said you added a yeast starter but I think that hot sauce fermentation is supposed to be a lactobacillus fermentation. I innoculated my current batch with some kimchi juice; it took off within a few hours and fermented (too) vigorously for about two weeks. You could give that a try. Moisture won't be a problem. Some people ferment in a fully submerged solution with roughly chopped peppers. No, no "pop" with the jars and no visible bubbling inside the jars. I've done a couple of other ferments, each of them with a few jars that each gave some rather rewarding pops within the first few days and died off after a week. Pepper ferments run a LOT slower than other stuff like beer & wine. Let it ride. Watch for small air pockets forming in the mash. So long as you're getting good smells and those air pockets are forming you're fine. I've had ferments that barely made a bubble and those that go nuts. It seems to depend partially on the chili used. Jalapeños seem to show little activity but taste great anyway with a low 3.5pH after 30 days. Also I smoke my chilies and since there is heat involved that may kill off the good bacteria, I try to remember to toss in an unsmoked fresh handful of each ingredient. Once or twice I forgot to do that and the activity was low there too but still good tasting sauces. Sure enough, a few days after this post of yours they did start to ferment... a bit more than anticipated, too. I actually had to remove some of the brine and mash because it swelled too much. I may have only give them 1.5" of headspace instead of 2". It’s finally been long enough that I made my first batches last night using one of the big jars. It started having Kahm yeast problems, so I wanted to use it before the flavor was affected like a previous batch I had. Not sure what I’m doing wrong, but it definitely came out more like a salsa than a hot sauce. Even adding more vinegar (white wine & rice) while blending, it separates rapidly. 1: Keep as is. Have an awesome salsa. 2: Add xanthan gum, hope it doesn’t make it too thick and and useless as both hot sauce and salsa. This stuff is spicy as heck, at least for me (probably tried too large of quantities of the stuff as a salsa, it would probably be good in amounts I would use as a hot sauce), and the flavor is great. My first guaranteed repeat recipe! There is a really good YouTube channel for fermenting peppers. Chillichump is the channel. I have no affiliation just found it really useful. My first real batch of this was great with some lime and a tad bit of sugar, with rice vinegar to get it to a hot-sauce consistency. Everyone who's tried it loves it. The second jar went better than the first, likely due to lack of kahm yeast. I've decided to cement the name as V3RDEGREE. Shout out to Navy buddies who get the reference. EM1(SS) is probably the only one who will get it - and will be rolling his eyes, undoubtedly. So, found a new trick. 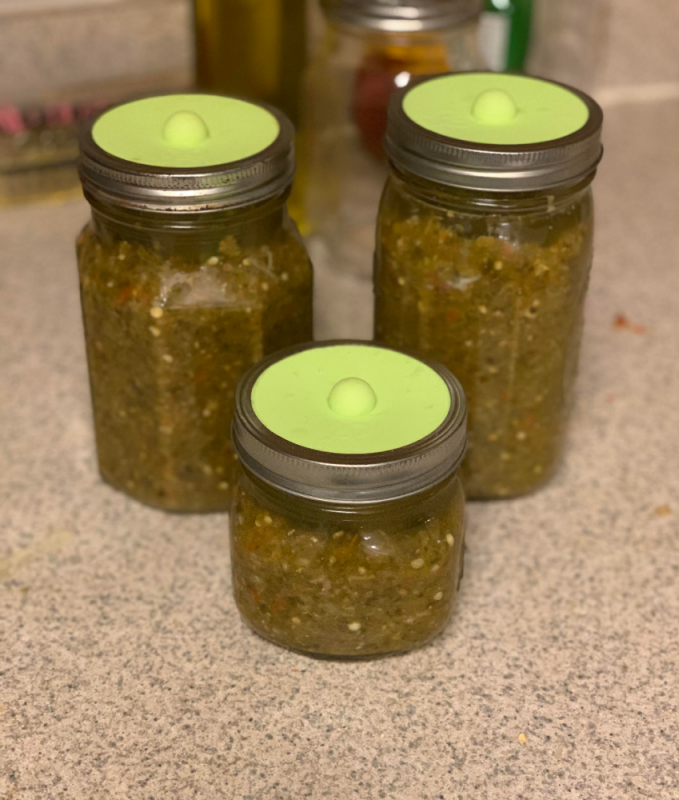 Bottled a variant of this sauce (used dried Thai Chilis instead of Habaneros) and it was sort of a flop. Mild heat, mild flavor. I added lemon juice and sugar, which probably cut the heat, but didn't add enough flavor. V4RDegree was a flop. I went this route because I figured upping the mass-per-volume of the mash would concentrate the flavor it did have, as well as the heat. I decided against sugar this time, and instead let the lime juice do the talking. (I actually drained some of the liquid to give it more of a salsa consistency, afterwards, it was more like a thin salsa/thick hot sauce). Edited by Pharthan, 28 December 2018 - 10:25 AM. This Saturday I'm planning on redoing this one with shallots instead of onion and adding in the flesh of two limes into the mash, as well as using a yogurt-starter. I'll be sure to take pictures/measurements. Probably shifting the Habanero-Serrano-Jalapeno content in favor of habs and serranos. I was going to try to get my hands on superhots, but being that they're out of season, I think I'm going to have to wait. Until then, this ferment is definitely a winner. Some of my friends can't get enough of it and were depressed to find out that I'd started to run out of mash to bottle more sauce. Edited by Pharthan, 02 January 2019 - 09:04 PM. Narrowing down on my V3rdegree sauce recipe. Tossed peppers/garlic in olive oil and roasted for X minutes @ 450F, then rinsed and padded dry to remove as much oil as possible. Edited by Pharthan, 06 January 2019 - 11:37 AM. It's a play on the word "verdigris," which is a greenish mixture of corrosion products, frequently found as sludge when it starts clogging pipes - we deal with it occasionally at work, which was the original taste-test audience. The name was successfully semi-humorous, semi-eye-roll-worthy. This is also my third overall mixture for hot sauce, albeit this new batch is altered from the original. Edited by Pharthan, 06 January 2019 - 12:37 PM.